The year is about to end which means these last 3 months is the last chance for companies to release their games before it becomes 2019 and the whole cycle of porting games and making new games begins anew. This month was supposed to be the release of an anticipated game ‘VARIABLE BARRICADE’ but because of ‘circumstances’ Otomate has delayed it until April 2019 which is a long time for some folk (myself included). VARIABLE BARRICADE really can’t catch a break huh. With that much time between now and the release date, kinda makes you wonder if they’re going to make a Switch port or change the voice actor for a character back to the original cast as the original voice actor has recovered from his illness now. But all that can be left to the imagination until more information is released about this game. Wand of Fortune R2 FD is a remake of the fandisc of Wand of Fortune 2 for the PSP game. To be clear, it is part of a series of remakes to the PS Vita starting with Wand of Fortune R (remake of the original PSP game) in 2016 with it’s sequel Wand of Fortune R2 in 2017 and now the fandisc is releasing this year. Being a remake means there may be tweaks to gameplay as well as renewed CGs and art. 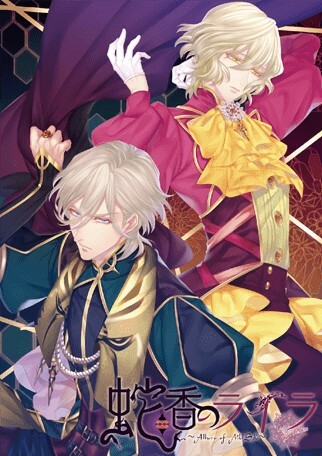 Cendrillon palikA was originally a game for the PS Vita until in May 2018 Otomate announced it will be a Nintendo Switch exclusive game. So this game will become Otomate’s ‘first’ original Switch game (this excludes the ports to the Switch back in September). The game is a retelling of the story of ‘Cinderella’, where the setting is in a town called ‘Tokyo’ (spelt differently than Tokyo, Japan in terms of kanji characters) where residents are cursed to wear glass on their body in order to go outside. Kannagi no Mori — Vol.2 Ryujin Kaidan is a the second volume of a PC game under the same name. In this volume you can romance 3 other boyos (whom may or may not be mythical in anyway). The heroine Mizuki Kinami is able to see things no other human being could: ghosts, spirits and other supernatural beings. This game has been delayed a couple times this year so here’s hoping it’ll release for real this month. Shinoda Shinjuku Tantei Jimusho – Karajishi Botan is a mouthful of a title and is also an R18+ BL PC game. This game is based in the same setting as HolicWorks’ BL Drama CD under a similar name (Shinoda Shinjuku Tantei Jimusho series). Expect it to be a Detective/Mystery-Crime story. Katakoi Contrast -Way of Parting- Vol.2 is the second volume of three volumes of a PC Game that focuses on love triangles in a high school setting. Last volume that released last month focused on a love triangle between classmates while this volume focuses on a love triangle between the same heroine’s kouhai and senpai. Illustrated by Udajo. I have no idea if it’ll get an English version but it would be nice if it did. Cendrillon Palika is the game im really excited about, really hoping they’d localize sometime in the future, importing is expensive af ~_~ Thanks for this post! Those BL games looked interesting!